For the last 15 months, when the weather has been cooler, I’ve been wearing fleece Pokemon hats almost religiously. They’re nice to wear indoors or outdoors. They keep my bald head warm. They just look really fun and cool. 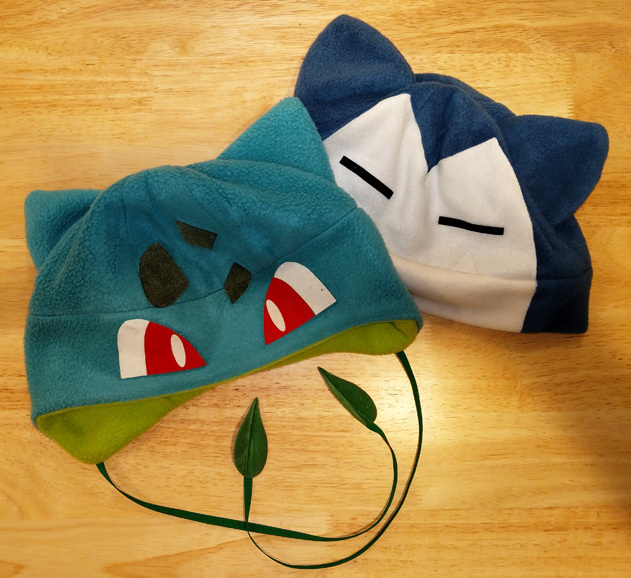 I get comments all the time from strangers about how cool my Bulbasaur hat is. I’ve got 4 different ones that I purchased from a con vendor between the last two MAGFests. Early this year though, I started making my own, including the 3 in the image above. Making my own hats gives me more excuses to use the sewing machine I bought for last year’s cosplay project. It’s a fun challenge to learn the various aspects of design, patterning, and assembly. It’s fun to share (and wear!) what I’ve made with everyone else. Some of the skills overlap with new cosplay projects I’m starting. So really there’s lots of great reasons to do this (or so I tell myself). This is by no means a side industry for me, but as I go along I’d like to share what I’ve made and learned. That will probably include a couple of tutorials, as well as the patterns I’ve created and digitized. When I was originally out searching for information on this topic, I came up surprisingly short-handed for making the particular kind of hat I wanted. So while there’s great resources out there from people clearly more expert than myself, I hope pulling this information into a common place will be helpful. A particular kind of what? Both years I’ve been at MAGFest, there’s been 2 or 3 vendors on the floor selling these fleece hats of Pokemon and other video game or movie characters. Since these are all hand-made items, each vendor has their own spin on how to design and build their hats. For example, all of the hats at one vendor follow a beanie template constructed from a single piece of fabric. This is the same kind of pattern that is easiest to find when looking for resources online. The kind of hat I want to build is assembled from multiple pieces. An upper half made out of sections of “orange peel” and a lower half that could be a straight band or have ear flaps built in. Constructing a hat from multiple pieces creates more opportunity for sewing in features like ears, spines, tails, or other fun details. Another difference is how details like eyes are created and added to hats. Some vendors cut out additional pieces of fleece or felt and sew them onto the hat, which I think gives a ragged look. An alternative is to cut out pieces of fuzzy vinyl heat transfers and iron them on. The details are sharp and there’s more opportunity for layering. Perhaps the biggest reason I’m diving into all this is the vendor that used all those techniques I like, Athena’s Wink, has since closed their business. If I want hats like that, I may not be able to find them at the cons. I’ve got to make them myself. And I still have a few more I want for my personal use, like a Scyther and a Gumo.